The Mercedes-Benz unveiled a new flagship S-Class sedan. However, not specifically. The car was seen during the tests in Europe, and was caught in the "sight" camera, adding to a series of spy shots. 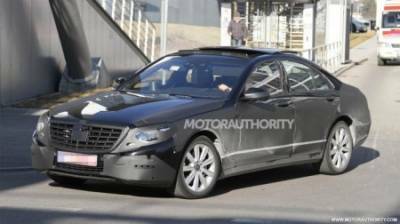 Although he was dressed in camouflage, you will notice that the 2013 Mercedes-Benz S-Class received a new LED daytime running lights, larger grille. The updated model is also slightly larger than its predecessor. Among the characteristics of the model can be noted the new economical and environmentally friendly engines, which in combination with the "start-stop" and the heat recovery braking system will consume less fuel. Also expect to see a 9-speed automatic transmission, improved suspension, lighter body.